These dry bags will protect your valuables from water, sand, dust, etc. 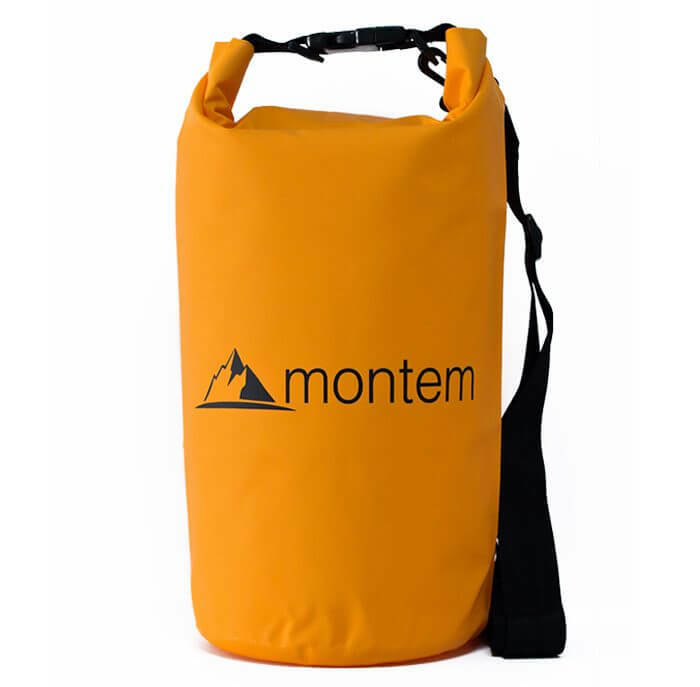 Carry along the Montem Outdoor Gear Dry Bag with you as you head on to the next rafting trip. The dry bag goes by its name - it is dry, and shall carry and keep all the things inside dry and safe from dust and moisture. So, whether you are going on a kayaking or boating trip, or even going to a rain forest in its wettest season, your food, clothes, and camera equipment need all the dryness it can get. So, investing in Montem Outdoor Gear Dry Bag is vital and shall keep each of these things in the optimum dry mode. When it comes to going on trekking or outdoor camping expedition, one cannot carry the world along. Trekkers, who have to climb high up on their way to the base camp through rugged lands, might rather think of traveling light. Just the basics would be necessary and it is for the same reason, carrying a dry bag, which is waterproof and which shall even find use as a temporary pail for carrying water would be a great outdoor gear. Lets look at the features of this awesome dry bag below! High Grade 500-D PVC Material: The Montem Outdoor Gear Dry Bag comes in 500-Denier PVC material, which is already famous for being really strong when it comes to being water resistant. It is however, very light in weight and easy to maintain too. You are able to carry it in any temperature and climatic state too. The UV-protection cover does not allow the Ultra-Violet rays to enter the bag or affect the contents in any way. The material is perfect for beginners and veterans alike while they go trekking or canoeing. Strength and durability: The Montem Outdoor Gear Dry Bag has immense strength and the Thermo welding technology makes sure that the seams do not come off even as you handle the bag quite rough. The dry bag that you pick shall remain yours for many days to come even after rough handling, since the brand keeps in mind that it will be for the rough travelers and explorers. 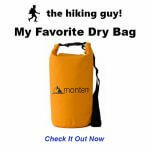 Sizes and Dimensions: The Montem Outdoor Dry Bag comes in three sizes of 5L, 10L and 20L. The 5L comes in the dimension of 11.8” x 12.6”. The 10L comes in 11.8” x 18.5”. The 20L comes in 14.6” x 20.1”. The 5L ones are perfect for carrying things for a weekend hike or even for a single person. The other two sizes shall be able to carry delicate items like camera lens, and books. The 20L is perfect for those photographers or mountaineers who shall go on long trips and shall even be taking any means of transport to make the most of the journey. Watertight bags: One of the main reasons that these dry bags are becoming popular with the travelers is because of its strength and of course, for being dry and waterproof. The watertight plastic coating shall ensure that even if your dry bags takes a dip in the rough waters, your contents inside it shall remain dry. Stuff your bags with the essentials and do not worry a bit about stepping out in any climatic condition now. Just roll over the fabric at the top opening and your water-proof bag might just protect everything inside your bag comfortably. Carrying straps: Those adventurers who would rather wish to go hands-free and not prefer to lug or tow around a case, or trolleys, might like the over-the-shoulder straps. These straps from Montem Outdoor Gear Dry Bags are easy to carry and give optimum comfort to the back and shoulders while you trek or go hiking across the mountains or rough terrains. This shall also not give you the feel of lugging around a really heavy bag even if you are walking higher up in the altitudes. To add to it, these shoulder straps are also adjustable. Value for money: After you are back from a trip, just give it a simple wash and then put it out to dry. It shall be good as new and ready for the next journey. This product from Montem is very famous in the adventure and extreme water sporting community for its longevity. The ratings of the bag in Amazon.com are on the higher side, mainly for its carrying capacity and the easy to use features. This waterproof dry bag one of the best rated drys bags on the market. With an average rating of over 4.5/5 stars on Amazon.com, it’s quite apparent that this product has and a positive reputation among its buyers. People rave about the quality of the stitching and the sturdiness of the material. You too would not likely be disappointed. Montem as a brand enjoys much more trust from travelers and adventure enthusiasts alike because of their products that are available at affordable prices. You need not worry too much about durability because the company also offers a warranty of one year with every purchase. For regular backpackers, dry bags are tailor made for adventure and it shall be able to withstand extreme temperature ranges. It shall be able to handle stress and even weight load as you lug it up on your ATV or SUV without much care. Roll it down from the top, and the backpack is ready for its next journey. So, for your next adventure to the wide world, do not miss out on your reliable travel accessory- Montem Dry Bag!